The Chancellor in his Autumn Statement today has formally backed National Infrastructure Commission's submissions that East West road and rail links should be pushed ahead. Philip Hammond has today pledged £110m for the East West Rail link via Cambridge, Bedford, Milton Keynes and Oxford and committed the government to backing the East West Expressway road between the same locations, previously announced at the weekend with a £27m fund. Today's Autumn Statement confirmed the Oxford to Bedford (western) section of East West Rail will see a £100m commitment to accelerate design and development, and a further £10m will be spent on exploring options for the Bedford to Cambridge (central) section of East West rail. 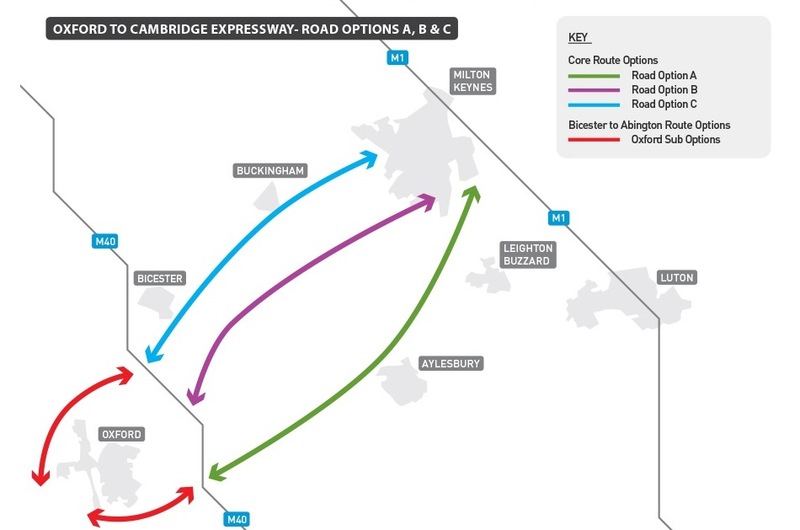 The Oxford to Cambridge Expressway will also be developed, with £27m for delivery by the 2020s. "The investments I have announced today will support a strong economy and a country that works for everyone, no matter where you live. Investing in the nation's infrastructure is at the heart today's Autumn Statement and that's why the East of England will benefit from significant funding for a railway line passing through Bedford and Cambridge as well as an Expressway to Cambridge, reducing journey times for local people and businesses." Milton Keynes MPs Iain Stewart and Mark Lancaster welcomed the £110m East-West Rail investment. MK South MP Iain Stewart has long been pushing the Commission and the Government hard to explore the economic benefits across the region. Reacting to the news he said: "This is very positive news for Milton Keynes. The project will not only promote economic growth, but also drive regional regeneration and support job creation. If we get this right we could well create the UK's Silicon Valley- an area recognised internationally for science, technology and innovation." MK North MP Mark Lancaster added: "This demonstrates the Government is serious about investing in the infrastructure necessary for MK's expansion and future growth. Iain and I will be working closely with the Government to make sure the project is carried through and delivered." A spokesman for Opus Energy, the UK's sixth biggest business energy supplier has backed the move, saying: "Providing a link between our oldest centres of excellence is a bold and strategic move. We know the benefits of working with the talent that resides in this area; driving innovation and excellence. Linking these two powerhouses via Milton Keynes makes real business sense. It enables better connectivity and greater idea sharing. We know the benefits of operating in different regions across the UK, as our offices in Oxford and Northamptonshire offer something new to our business. We hope this connection will facilitate these benefits for other businesses, who can captialise on this opportunity." Mayor of Bedford, Dave Hodgson's told Heart he welcomes today's news but there must be serious investment and proper work to improve links east of the town to further improve the Black Cat Roundabout and the pinch-points around St Neots. "We need those problems to be sorted out so travel times can be reduced both east and west", Mayor Hodgson commented. John Bridge, Chief Executive of the Cambridgeshire Chambers of Commerce fears the cash will only go towards researching the East West Expressway rather than actually building the thing: "A study doesn't deal with a congestion it just enables people to look at options. What we want to see is action and diggers on the ground. There were many studies on the A14 and that's over 20 years ago and we're only now just about getting that implemented." Cambridge MP Daniel Zeichner said: "In the first Autumn Statement after Brexit we saw the Tories predict slower growth, higher inflation, weaker tax receipts and higher borrowing. Britain's Brexit black hole is at least £122bn. It is clear the Tory Brexit shambles is starting to hit. This is bad news for families in Cambridge and bad news for our public services. I was astonished that nothing new was announced on resources for our NHS, this comes at a time when doctors and patients are crying out for more resources. I'm pleased that the Government have listened and re-confirmed their investment in the Oxford to Cambridge express way. But this policy has dragged on for too long, let's get shovels in the ground instead of more promises. I have long called for new borrowing powers, including tax increment financing for cities like Cambridge. I look forward to seeing the details of his plans for new borrowing powers for mayors. The Chancellor has also decided to abolish the autumn statement and changed the date of the budget, could this be a cynical attempt to add on 'extra time' to meet the financial targets the Tories have already missed? Overall this statement is a total rehash of many policies that have been promised for years".